We arrived at Pongola Game Reserve on the afternoon of 30th March booked in at Nkwazi Lodge. 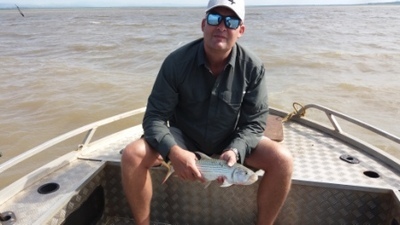 The plan was to target Tiger Fish spinning with artificial lures. The water levels are still low, but better than my previous trip in October last year. At least they have had rain and the area is green and did not look like a fire had swept the area like it did in the peak of the drought last year. For 4 days we fished morning and afternoon sessions spending about 8hrs on the water each day. Sadly the water was the colour of coffee and we had no luck with the lures, even 4cm into the water and one could not see the lure and so we decided to switch to bait fishing on anchor instead. The early mornings had a slight nip in the air, but by 8am it was hot and the afternoons were extremely hot with very high temperatures. Between 3 of us over the 4 days we managed to land a total of 59 Tiger Fish and a fish that we were told is a sliver fish (Never seen this before), and probably lost another 259 fish or even more with so many on/offs we lost count, but this is very typical with Tiger Fishing especially when the smaller ones hit the baits. Most the fish we caught were under 1Kg, but we did get a few over the 1kg mark with the biggest fish under 2Kg, having said that all the fish we caught weighed exactly 1.2Kg according to a faulty scale no matter the size of the fish. I fished with my little 6"8" Shimano Crucial which gave good sport on some fish, am really amazed at the sensitivity of this blank. I was really hoping for at least one big Tiger and the adrenalin rush but it did not happen and that was rather disappointing. Lots of jokes and rubbish talk always makes for a great day out to fish and chill. 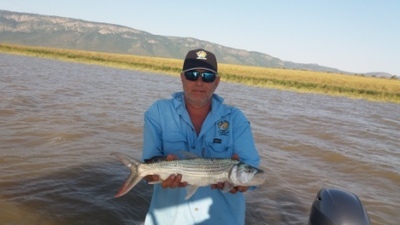 I still love fishing at Jozini, even if we had to fish with bait, whilst fishing one gets to see and hear nature all around, we saw a herd of Elephants on 2 of our sessions, Buffalo, Hippos, Rhino, Crocodiles, many species of Buck, other smaller animals and a huge variety of birds. At the end of everyday one is treated to the most gorgeous sunsets. One can't help getting completely relaxed and at peace in a place like this and leave being completely recharged. I included some pics with fish jumping out the hands when taking the pic just for the facial expression and the pose which I thought are really natural and very funny and when looking at them we all had a really good laugh.